40 years old seedling. 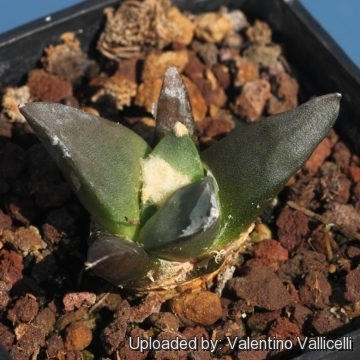 The variety "furfuraceus" is distingushable for the dark green-brown-grey equilaterally triangular shaped tubercles with abundant white wool at the apex. The tubercles are also usually more obese, pointed and smooth, with areoles on the tip. Origin and Habitat: Widely distributed in Coahuila, San Luis Potosi, Tamaulipas , Zacatecas and Nuevo Leon. 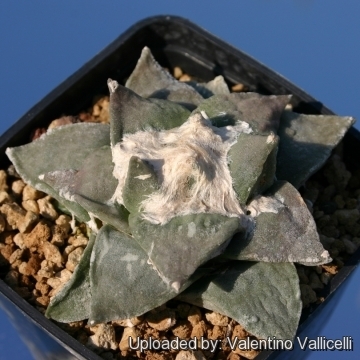 Description: Ariocarpus furfuraceus differs from the standard Ariocarpus retusus only for its equilaterally triangular tubercles, all the other characteristics clearly show that they are conspecific. 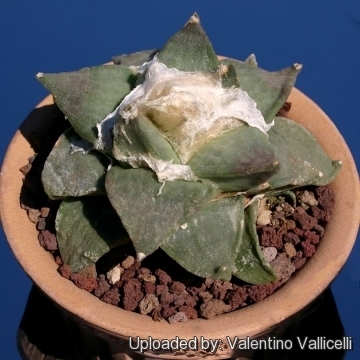 Ariocarpus retusus is quite variable and has received numerous unnecessary names of no botanical value, representing no more than local phenotypes: Ariocarpus furfuraceus is one of them. 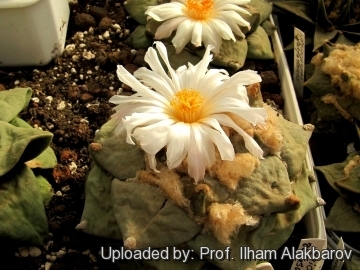 Habit: Solitary, slow-growing geophyte cactus, with tubercles slightly projecting above ground level. The large tuberous body is below the soil. Stem: Grey-green, flattened, globose, rounded on top, 3-12 cm high, 10-25cm in diameter. 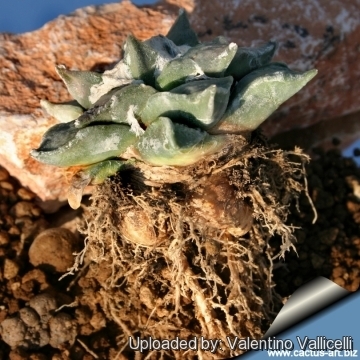 Tubercles: The distinctive characteristic of Ariocarpus furfuaraceus are the tubercles, which are equilaterally triangular shaped, divergent, convex or nearly flattened adaxially and often with shallow adaxial undulations or wrinkling, not fissured, 1,5-4 cm long, 1-3,5 cm wide, nearly as wide as long. Areoles: At the tips of the tubercles, rounded, 1-5 mm in diameter. 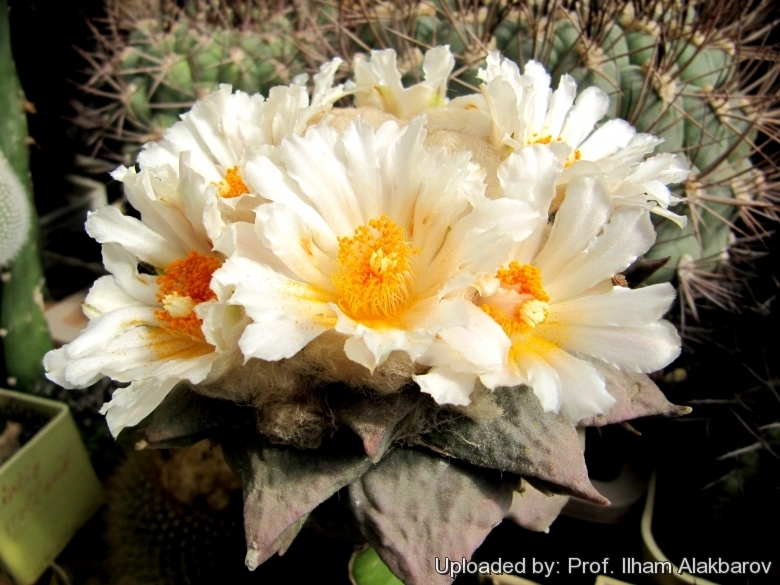 Flowers: Diurnal, 4-5 cm in diameter, 2-4 2cm long, white to clear pink. Fruit: White, green, or rarely pinkish, 10-25 mm long, 3-10 mm in diameter.